Decades before the latter day country music hero, the state of Texas produced another music maker called George Jones: an outstanding early blues guitarist and singer who went by the name “Little Hat”. George Jones (misidentified by many outdated sources as “Dennis”) was born on his formerly enslaved grandfather’s farm in Bowie County, Texas—in the farthest northeastern corner of the state bordering Arkansas—on October 5, 1899, the only child of Felix Jones. He dropped out of school after the sixth grade to help his ailing father on the farm after a loss of the season’s crop of cotton. Jones claimed to have started out playing piano at church, but switched instruments after his mother “done gone and found an old guitar for [him] to pick.” Influenced by Blind Lemon Jefferson, he learned to play in a peculiar fast, melodic, and uniquely rural style rather reminiscent of Mississippi John Hurt, albeit rougher, more driving and more formulaic, marked by occasional injections of a boogie-woogie beat. His habit of starting out a song at a breakneck tempo and slowing down before beginning to sing, intentional or not, added a certain sense of tension to his recordings. Probably around the age of seventeen, after his father and the farm recovered, Jones started making money with his music, but continued to make his living by means of various employment as a laborer throughout all of his life. While working a construction job in Garland, Texas, Jones was nicknamed “Little Hat” by his boss (who reportedly even made out Jones’ paychecks to that name) because of the cut-down brim on his work hat. When the Okeh record company made a field trip to San Antonio in 1929, Little Hat Jones cut his first recordings as an accompanist to fellow Texas blues man Alger “Texas” Alexander, who had been recording with Okeh since ’27. On the fifteenth of June of that year, Jones recorded eight sides backing Alexander and a further two solo. He was behind the microphone again six days later to cut four more solo sides, and again four more when Okeh returned to San Antonio the following year, netting a total of five records issued under his own name. Though he never again recorded commercially after 1930, Little Hat Jones continued to play at juke joints and booger roogers in and out of the state of Texas alongside the likes of J.T. “Funny Paper” Smith and, reputedly, Jimmie Rodgers and T. Texas Tyler. Jones claimed that Okeh invited him to record further in New York, but that evidently fell through. He settled down with his wife in Naples, Texas in 1937, where he remained for the rest of his life, eventually finding steady employment at the nearby Red River Army Depot. In 1964, Jones was interviewed by local newspaper man Morris G. Craig of the Naples Monitor and recorded—still in fine form though a little rusty on the guitar—playing several more songs, including a re-recording of his 1929 “New Two Sixteen Blues” and a rendition of Jimmie Rodgers’ “Waiting for a Train”. Little Hat Jones died on March 7, 1981 in the Municipal Hospital in Linden, Texas, and is buried in the Morning Star Cemetery in Naples. In spite of his relative obscurity, the music of Little Hat Jones was remarkably influential. Echoes of Jones’ “Two String Blues”—in particular the lyric “I’m goin’ to Lou’siana, get me a hoodoo hand… I’m gonna stop my woman and fix it so she can’t have another man”—were heard later in Lightnin’ Hopkins’ famous song “Mojo Hand”. Jones’ music gained later fame outside of record collecting and blues circles for the inclusion of his “Bye Bye Baby Blues” in Terry Zwigoff’s 2001 motion picture Ghost World. 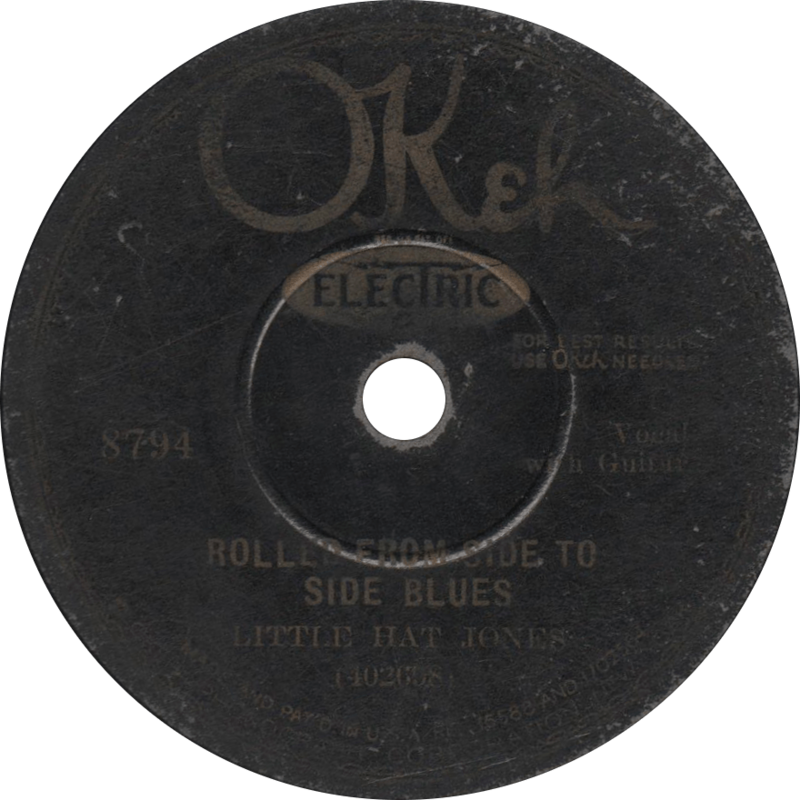 Little Hat Jones recorded Okeh 8794 on June 21, 1929 in San Antonio, Texas, his second record date, a week after his first recordings accompanying Texas Alexander. It was released in 1930. First up, Jones plays and sings the outstanding “Rolled From Side to Side Blues”, borrowing its name from a stanza within his debut recording “New Two Sixteen Blues”, which he reused in this song. It’s a wonder that guitar didn’t catch fire—just listen to those descending runs! Rolled From Side to Side Blues, recorded June 21, 1929 by Little Hat Jones. On the reverse, he combines the classic railroad song with the blues for lost love on his eponymous “Little Hat Blues”, most certainly my favorite of Jones’ recordings, and in my opinion one of the great masterworks of country blues (though that “Bye Bye Baby” is a dilly, no doubt). 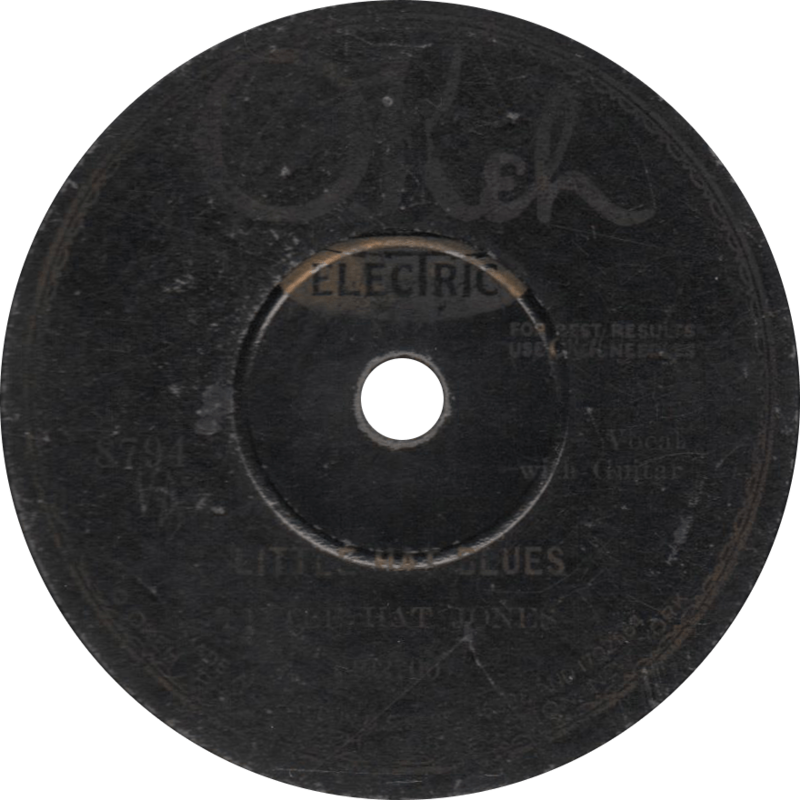 Little Hat Blues, recorded June 21, 1929 by Little Hat Jones. I lost my voice in jail… I’m always behind a few bars, and can never get a key.